When I published my Guide to Multifunction Pens back in January, my friend Leigh immediately reached out and asked why I hadn't yet tried one of Tombow's multi pens. Though I had purchased a LOT of multi pens in preparation for that piece, I had missed Tombow entirely, probably because they are not easy to find here in the U.S. Leigh was kind enough to send me (via Dan the pen mule) a Tombow Zoom L104 multipen, in metallic orange. The Tombow branding is minimal, and blends into the finish. You might even miss it if you don't look carefully. Tombow is a well-known Japanese stationery company that makes a wide range of excellent products, from high-end woodcase pencils like the Mono line to multifunction pens and mechanical pencils to fountain pens. The Zoom L104 is no exception. It's a sturdy, utilitarian writing instrument that still manages to look interesting. I especially like the combination of the metallic orange pen body with the matte black clip. One drawback - the coating on the matte black clip tends to scratch, so I'll have to ding Tombow a little for that. Still, it's held up pretty well, considering how hard I've used this, slinging it around in bags and pockets. If I had to compare the Zoom L104 to another multi pen on the market, it would be Zebra's Sharbo X. The Zoom is ever-so-slightly longer, and a bit heavier, which gives it a nice balance. 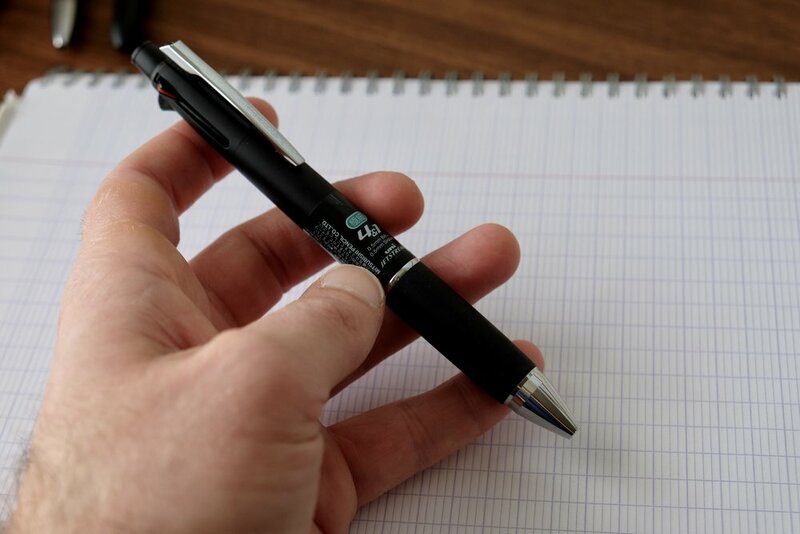 The Sharbo, while it makes a great "planner pen," can feel a bit light and short. I've used the Tombow to take pages of notes in meetings and found this a very comfortable pen in the hand. Both the Zoom and the Sharbo have three refill slots - two pen refills and a mechanical pencil. While the Sharbo X requires that you purchase separately Zebra's excellent (but expensive) D1 gel refill, the Tombow Zoom L104 ships with two Tombow .7mm ballpoint refills that remind me of the Sailor refills in the Imperial Black multi pen. These Tombow ballpoint refills write smoothly and are all-around excellent D1 ballpoint refills, if you can find them. That said, my favorite D1 refill of all time remains the .5mm Uniball Jetstream refill, which gives you the smooth writing experience of a gel pen with the write-anywhere reliability of a ballpoint. Pull off the bottom part of the barrel to expose the refills. D1 refills are universal, so any pen that accepts them is exceptionally versatile. The L104 and the Sharbo X also use the same style of "shifter" to switch between refills. As you rotate the lower part of the barrel, a different refill unit clicks into place. If I had one critique of this design, it's that there's no secure way to retract the refill for "safe" carry (for example, when you're carrying the pen in a shirt pocket). To retract the tip, you rotate the barrel halfway between refills and basically leave the pen in "in-between" mode, which raises the risk of accidentally extending the refill and staining your shirt, or purse, or pen case, etc. This isn't so much an issue with a ballpoint refill, but if you swap in gel refills, consider yourself warned. And, like many multi pens, you unscrew the end cap to expose the eraser. You can also get a glimpse of the shimmer on the metallic finish here. The Tombow Zoom L104 typically runs around $30, and you may have to hunt for it. If you're in the U.S., Amazon is probably your best option, as there are multiple Japanese sellers who stock the pen. The Zoom L104 is a solid multi pen option, and this one has won a spot in my rotation as a reliable workhorse. Many thanks to Leigh for my first introduction to Tombow products - I wish they were more widely available over here! The black ion-plated trim on the multi pen matches the trim on the Professional Gear fountain pen nicely. Given the wide disparity in price points, I expected the Imperial Black multi pen to look cheap compared to the fountain pen, and for there to be a noticeable difference in the build quality. Not the case. The black ion-plated clip and trim are the same as on the fountain pen, and the matte black finish is equally well-applied. (Note: Nearly four years later, the matte finish on my Imperial Black fountain pen has become a bit glossy and worn from use. I expect the same from the multi pen, and from any "matte black" pen for that matter. It's normal and gives the pen a nice wabi-sabi effect.) Photographed together, these two pens look stunning. Sailor should consider selling these as a two or three-pen set. The Imperial Black fountain pen is a relatively light and compact writing instrument that's easily carried in a shirt pocket. The multi pen also makes a great daily carry tool, but it's heftier than its fountain pen equivalent. While the fountain pen is made from matte-black acrylic, the multi pen appears to be coated brass. The metal construction gives the pen some weight, though I still find it to be well-balanced and very comfortable to use. The pen is almost exactly the same length as the Lamy 2000 four-color ballpoint, but slimmer around the middle. The Imperial Black multi pen uses widely available D1 refills. The stock Sailor refill is excellent, though a bit hard to find. In my recent Guide to Multifunction Pens, I noted that one of the big decision points when selecting a multi pen is the price/availability of the refills. Fortunately, this pen uses the non-proprietary D1 refill, which is relatively easy to find and available in a wide range of ink types. (There's even a highlighter refill made by Lamy, which I've been using a fair bit.) I will say that Sailor's "Chalana"-brand D1 ballpoint refills have impressed me. I'd compare them to the Uniball Jetstream refills in terms of smoothness, even in the "fine" or "extra fine" tip size. Like the Jetstream, there's not a wide range of colors - you're restricted to black, blue, and red - but they can be shockingly inexpensive for how good they are. Pen Chalet currently has the blue and the black in stock at less than $1.50 each. The stock Sailor D1 refill writes a fine line that's smooth and very dark for a ballpoint. So if I had to make a recommendation between this and the Lamy 2000 multi pen, what would I go with? That's a tough one. For me, it comes down to two things: (1) weight, and (2) whether you need a mechanical pencil function. While I don't consider the Imperial Black multi pen too heavy to use, it's definitely heavier than the Lamy 2000, so anyone particularly sensitive to that sort of thing should be advised. The Sailor also has a built-in .5mm mechanical pencil taking up one of it's four slots, whereas the Lamy is strictly a 4-color pen. Since I use pencils a lot during the workday, I find my self reaching more and more for the Sailor, and if I'm only carrying one pen, more often than not it's the Imperial Black that goes into my shirt pocket. Either one is excellent, however, and what you ultimately choose should determined by your personal needs and preferences. One of the big selling points of the Sailor Imperial Black multi pen is the mechanical pencil function. The top of the "cap" unscrews to reveal a pink eraser. As far as I can tell, neither the Imperial Black Multifunction Pen and the Imperial Black Ballpoint (which I have not tried) are available outside Japan, so you have to order both pens from a Japanese vendor. With respect to the multi pen, there are multiple Amazon sources you can purchase from, but as is common with overseas vendors, both price and availability can vary. Shop around. Disclaimer: I purchased the pen featured in this review with my own funds, for my own personal collection. This post contains affiliate links. I went on a bit of a multi pen binge these past few months. You know, "for science." From left, the Zebra Sharbo X, Lamy 2000 4-Color Ballpoint, Uni Style Fit, Pilot Hi-Tec-C Coleto, and Uniball Jetstream. Apart from fountain pens, I find myself using multifunction pens (or "multi pens") often. At work, I usually alternate between writing in pen and pencil, and on the pen side I regularly switch colors when I’m annotating documents and taking notes. When I’m at my desk at home, it’s easy to grab a pencil out of my pencil cup, or to simply reach for a different pen when I want to change colors, but if I’m sitting in a meeting at work or on an airplane, multi pens are the way to go. The universe of multi pens out there on the market, however, can be confusing and frustrating, and if you don’t do your research on the front end you can wind up with an unpleasant surprise when your refills run out and you realize replacements are unexpectedly expensive or difficult to find. In this brief guide, which is intended to offer a little more information than your typical “top 5 pens” list, I’ll walk you through what I think are the five best multi pen options for most people, with an eye to quality, overall cost, and refill availability. My first two picks, the Lamy 2000 4-Color Ballpoint and the Sailor Imperial Black Multifunction Pen, might come as a surprise to people because they are more expensive pens than the others. However, they top my recommendations list because both are built to take a beating and accept the non-proprietary D1 refill, which comes in a wide variety of ink types and colors, some of which are very inexpensive. While D1 refills have their drawbacks - for one thing, gel versions can run out very quickly - pens that use the D1 “system” are more versatile, and you can usually find some sort of inexpensive D1 refill available at your local office supply store in a pinch. The Sailor Imperial Black Multi Pen is just as good looking as its fountain pen sibling, with a matte finish. For each of the pens I discuss, I link to a purchasing option and also to a full review of the pen in question. If I've personally done a review, I've used that. If not, I've tried to locate a good review by another blogger if one exists. Sailor Imperial Black Multifunction Pen. Sailor’s latest “Imperial Black” pen was another pleasant surprise for me (though I don't know why because my experience with Sailor has generally been good). If you’re looking for a higher-end multi pen with excellent finishes, a blacked-out "stealth" color scheme, AND a dedicated mechanical pencil slot, this would be my recommendation. The pen also accepts D1 refills, and Sailor’s inexpensive “Chalana” .5mm ballpoint refills write well, even if they are somewhat difficult to find. Oddly, it seems that nobody has written a thorough review of this pen, which I'll have to remedy soon. Multi pens in general aren’t as expensive as fountain pens (or even most high-end ballpoints or rollerballs). Up front, that is. As I mentioned earlier, to be happy with a multi pen system in the long run, you’ll want to keep an eye on refill cost and availability. A multi pen that uses the universal D1 refill will be the easiest and most economical for most people to deal with long-term, especially if you use longer-lasting ballpoint or hybrid ballpoint ink. D1 multi pens are also the most versatile, providing the option of writing with ballpoint, hybrid ballpoint, gel, and even highlighter ink. The only question remaining is whether or not you want a mechanical pencil option. Neither the Uniball Jetstream nor the BIC 4-Color multi pens are primary carries for me, though I own both and use them regularly in situations where writing with a ballpoint is called for. They’re also priced low enough that I don’t feel guilty about only using them sporadically, whereas my more expensive Lamy 2000 and Sailor Imperial Black pens get used all the time. Hopefully this overview was helpful. I enjoy using multi pens, and as always, I will try to update this guide as new options come to market. Disclaimer: I purchased all of the pens that I tried for this feature with my own funds, for my own collection. This post contains affiliate links. And it now comes in a "professional" gray and black model! Looking for some easy stocking stuffers that won't break the bank? Look no further. I was doing a bit of last-minute shopping this past Friday and couldn't resist throwing a few of these into my cart. (One for me, two for some quasi-pen-addict family members.) I have fond memories of using these Bic multi pens as a kid, and while I expected to find that my memory was playing tricks on me, I ended up being pleasantly surprised. Bic's ballpoint ink is pretty good, and these don't write too broad a line. Grab one now from Amazon for the cost of a (nice) cup of coffee! I generally like the Bic refills better than the stock Lamy multi pen refills, with the exception of the green, which tends to be washed-out and gloppy. You can even string Bic multipens on a lanyard or string, if you envision using the pen for some kind of "in the field" work. This pen will definitely get some use, and I view it as the kind where I own multiples and leave them in various bags so I always have a decent writing implement on me, no matter what bag I may be carrying on a given day. The orange-barrel "fine point" Bic multi pen is on the way, so look for a writing sample comparison in the future. Disclaimer: I purchased this pen with my own funds for my own use. This post contains affiliate links. All Amazon prices and availability are subject to change, and only current as of the time of publication of this review.